View and download the PDF. 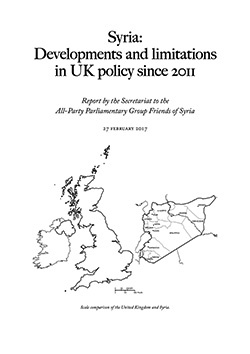 This report looks at how UK policy on the Syria crisis has developed, its constraints, and looks to questions that might be posed in 2017. The UK Government wants to see the defeat of terrorism in Syria and the resolution of the Syria refugee crisis by the establishing of representative inclusive government in Syria. However the UK is constrained in the ways and means it can employ to achieve this, both by the need to maintain international alliances—particularly with the US—and by domestic political resistance. The UK is most constrained in the area of military policy. Since September 2015, direct Russian military intervention has further constrained the UK’s military options. Unwillingness to assume responsibility for the possible consequences of regime collapse led the US and UK Governments to reject decisive military action against the Assad regime in 2012. The regime has nonetheless lost control across a great part of Syrian territory and it is now dependant on foreign military forces to survive. Fear of terrorism led UK Parliamentarians to oppose arming Syrian opposition forces in 2013. Subsequently weaknesses of opposition forces allowed Da’esh/ISIL/ISIS to seize a large portion of Syrian territory from the opposition in late 2013 and 2014. The UK has since followed the US in giving air support and training to the Syrian Democratic Forces (SDF) to fight ISIS in the north. The SDF is led by the Kurdish YPG, the military wing of the Democratic Union Party (PYD), linked to the PKK, a proscribed terrorist organisation in Turkey. The Assad regime’s ally Hezbollah, a proscribed terrorist organisation from Lebanon, now controls territory in Syria’s south west. UK diplomatic policy has followed a separate path to UK military policy in emphasising support for the Syrian opposition which opposes the Assad regime and also opposes the PYD’s dominance in northern Syria. The Syrian opposition includes the PYD’s Kurdish rival, the Kurdish National Council (KNC). Diplomacy without military pressure has failed to bring about a political resolution in Syria. Diplomatic and economic pressure has been limited by Russia’s support for the Assad regime, by prioritisation of the Iran nuclear deal, and by European reluctance to bear the cost of increased economic sanctions against Russia. The UK seeks to contain the Syrian refugee crisis to the region by means of humanitarian aid, and is a leading donor state. When in 2013 the Government failed to win approval for military action, the one area of cross-party consensus was in supporting humanitarian aid. The scale of the crisis has increased greatly since then with the number of refugees in the region going from 1.8 million at the time of the 2013 vote to almost 5 million today. With no action in sight to end regime violence and forced population displacement, the humanitarian cost is likely to continue to be high for years to come. Since 2011, military actions have determined political and humanitarian outcomes. Armed conflict and de facto partition between parties in Syria may continue for years. Resolution of the core issue of the Assad regime’s repression seems unlikely without firmer measures to constrain the regime and its foreign backers. Short of ending the Assad regime, the UK and its allies are nonetheless invested politically and militarily in the future of those territories of Syria now outside regime control, and so need to consider how best to use their influence in those territories to further the strategic goal of establishing representative inclusive government.